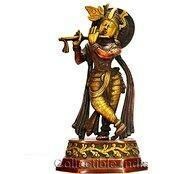 This is Vintage Finish of Very famous Indian lord krishna, playing flute Indian Home Decor Krishna Playing Flute India Hindu God Black Metal Brass Solid from India. This statue comes with beautiful hand carving work on it. The attractive designs carved on this statue make them perfect to be kept in luxurious and modern drawing rooms as a symbol of luck, wealth and prosperity. Size: Height:10 inches x Width:4 inches Weight: 2500 grams Clean it with soft cloth/soft brush. Krishna is famous for playing the flute.His flute playing would beguile the cow herder's daughters whom were all in love with Krishna.Krishna,besides being a hero and central figure of Bhagavad-Gita,was seen as an affirmation of life.He loved life and lived his time on this earth to the fullest. The flute he plays is decorated with a yali head on the end of it. A yali is a mythical beast that is a cross between a lion, an elephant and an alligator.